Palladium, 18k yellow gold, blue sapphires, white and yellow diamonds. Jo wrote to me from England to enquire about creating a 'Bee ring' for her. 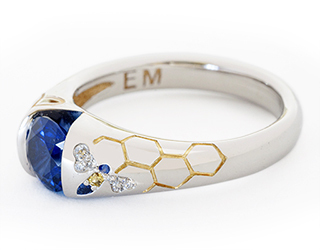 Together we designed a replacement wedding ring to represent all that is dear to her. Bee has been her nickname since childhood, her husband and children are represented by three letter Bs and the butterfly symbolizes new life.